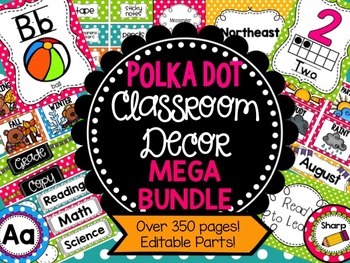 This Polka Dot Classroom Decor Mega Bundle includes everything you need to create a beautiful, coordinated classroom! Buy this bundle and save on each separate item (over a $20 value!!)! 400+ pages of polka-dotted fun! Portions of this pack are editable. Read below to see which parts you can edit! Download the preview to see everything included in this massive bundle! 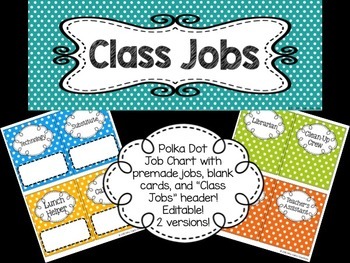 --Job Chart: includes 36 job cards as well as blank cards to add your own jobs (just laminate the cards and they can be used with dry erase markers). A second version is included without the blanks at the bottom for dry erase markers so that you can use velcro to attach your students' names or numbers. Also included is a header to add to your job chart in a variety of colors so you can find the one that matches your classroom best! Also included is an EDITABLE PPT file in both versions so you can personalize your job chart! The font used on the rest of the job chart is called KG Be Still and Know and you can download it for free HERE! --Editable Desk Name Tags: "Hello my name is..."
--Round Number Cards 0-120: these can be used for a number line, coat hooks, cubbies, mailboxes, numbering students, etc. --Schedule Cards: includes 48 pre-made schedule cards as well as blank cards to add any subjects not included. 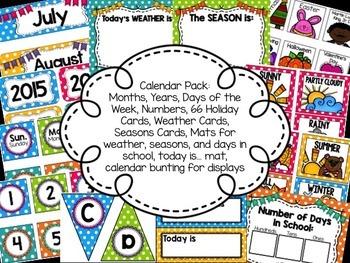 Each card includes a blank clock so the time of the subject can be written in (use a dry erase marker to use these cards again and again!). Also included in this set is an EDITABLE PPT file so you can type in your own subject on each schedule cards to meet your needs! --Round Supply Labels: these labels include one label for 36 different school supplies as well as 6 blank labels to write your own labels! The supplies include: crayons, markers, glue, scissors, glue sticks, pencils, notebooks, highlighters, paint, paint brushes, colored pencils, and rulers, notebook paper, sticky notes, dry erase markers, folders, red pens, blue pens, rings, push pins, calculators, pencil sharpeners, binder clips, paperclips, composition books, erasers, chalk, tissue, tape, and stapler (includes EDITABLE labels in a PPT file!). --Teacher Toolbox Labels: pre-made teacher toolbox labels to be used with a 22 drawer Snap-On container available at your local hardware store. Also included is an EDITABLE PPT file to create your own labels! --Word Wall Cards: A-Z round header cards and a 'Word Wall' bunting banner to hang up on your word wall! --Welcome Banner: a "Welcome" bunting banner to welcome your students and visitors to your class! Includes banner pieces for K-5th as well as Kinder-Fifth. EDITABLE version also included so you can create your own personal bunting banners! --Reminder page: laminate this page and place it by your door to remember transportation changes, announcements, etc. --Magazine File labels for organizing: Days of the week and subjects. Also included is an EDITABLE PPT file so you can customize your labels (these are 3" square labels). --Grade, Copy, File and Days of the Week labels for Sterilite 3-drawer organizer. Also included is an EDITABLE PPT file so you can create personalized labels to suit your needs! 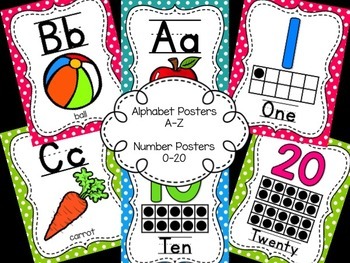 --Number Posters: Adorable number posters for numbers 0-20. Each poster includes the number, number word, and ten-frame version of the number. Everything you need is included in this pack! This will be a pack will continue to grow and grow so buy it now at this low price!! I hope you enjoy this pack! If you have any questions about the pack, please email me! Looking to stay organized in style this school year? Look no further than my Polka Dot Teacher Binder Organization Bundle! Everything you need to stay organized and on top of everything this school year!